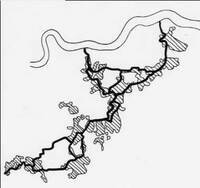 The 1976 Greater London Development Plan covered an intermediate area, a 25 km radius (Greater London Council, 1976 No individuals were named, but it is known to have been the work of planners from a social science background. Unlike its predecessors, the 1976 London open space plan was based on extensive social science research, initiated by the London County Council and completed by the Greater London Council. The research was described as "the most interesting and useful of any recent recreation study' (Burton and Veal, 1971). But it neglected the greenway idea and led to the bizarre conclusion that parks should be arranged in a hierarchy of different sizes: metropolitan parks, district parks, and local parks. The principle was illustrated with an attractive hexagon-diagram, reminding one of the cells in a behive, but one cannot see that this has had any discernible effect on London's open spaces. The greatest research investigation ever made into London open space was wasted. The most significant change in London open space planning since 1976 has been the development of a special type of greenway, described as a green chain. The original Green Chain was coordinated by the Greater London Council (Green Chain Joint Committee, 1977). The aim was to safeguard a number of open spaces and to develop their recreation potential. The open spaces were broadly in the form of a chain running through South East London (Figure 4). A green chain walk was planned as a link between the spaces, to join them as green beads on a grey necklace. The South London Greenchain is a signposted footpath connecting a number of public greenspaces.